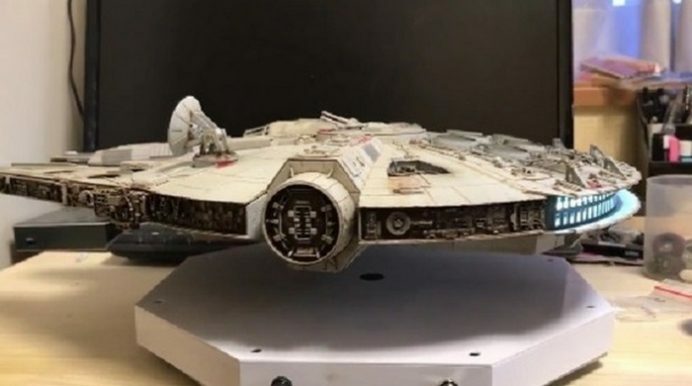 To celebrate the new Star Wars film Rogue One that released this December, ardent Japanese Star Wars fan and Twitter user @HanakiMasatoshi decided to build a neat, cutting-edge model of the Star Wars’ Millennium Falcon, and introduced a twist to the model. What gives this model an edge over other models that other fans have built over years? – Well, this one levitates. This brilliant effect was made possible by @HanakiMasatoshi by using a magnetic levitation system that allows the object to hover 2.8 inches above its base. The system has been created by Crealev, a Dutch company. This happens to be the second time this Japanese creative genius has showcased his smart levitating creations by building a floating reproduction of Han Solo’s prized possession. Last year, he built a smaller model that levitated at a slightly lower height – timing his first state-of-the-art creation to release around the debut of The Force Awakens. The Star Wars franchise plans to release a new film every year in December, at least for the next three years. This hopefully means that @HanakiMasatoshi’s flying fan tributes will accordingly be updated every year at the corresponding time. Let’s wait and watch!